This semester I am teaching a freshman writing seminar at Geneseo on the Lost Colony of Roanoke. The students have now finished reading through the bulk of David Beers Quinn’s famous collection of source material, and will begin writing their own papers this week. I compiled this bibliography, which I will share with them, at least in part to bring myself up to speed with what has been published since my book on the Roanoke ventures, The Head in Edward Nugent’s Hand: Roanoke’s Forgotten Indians, appeared a decade ago. Even though I have been intermittently at work editing my portion of the very large Oxford edition of Hakluyt’s Principall Navigations, I thought it worthwhile to check and see what was out there. This bibliography focuses most heavily on sources published in the last decade. For older sources, see the notes in The Head in Edward Nugent’s Hand. I hope you find this useful. Ambers, Janet, Joana Russell, David Saunders, and Kim Sloan. “Hidden History? Examination of Two Patches on John White’s Map of ‘Virginia’.” British Museum Technical Research Bulletin 6 (2012): 47-54. Andrews, Kenneth R. Trade, Plunder and Settlement: Maritime Enterprise and the Genesis of the British Empire, 1480-1630, Cambridge: Cambridge University Press, 1984. ________. Elizabethan Privateering. Cambridge: Cambridge University Press, 1964. Appelbaum, Robert. “Hunger in Early Virginia: Indians and English Facing Off over Excess, Want, and Need,” in Appelbaum and John Wood Sweet, Envisioning An English Empire: Jamestown and the Making of the North Atlantic World, (Philadelphia: University of Pennsylvania Press, 2005). Barker, Alex W. “Powhatan’s Pursestrings: On the Meaning of Surplus in a Seventeenth Century Algonkian Chiefdom,” in Lords of the Southeast: Social Inequality and the Native Elites of Southeastern North America, eds. Alex W. Barker and Timothy R. Pauketat, Anthropological Papers of the American Anthropologica Associations 3 (Washington, D.C: American Anthropological Association, 1992. Beck, Robin A., Jr., David G. Moore and Christopher B. Rodning, “Identifying Fort San Juan: A Sixteenth-Century Occupation at the Berry Site, North Carolina,” Southeastern Archaeology, 25 (2006), 65-77. Benitez-Rojo, Antonio. The Repeating Island: The Caribbean and the Postmodern Perspective. Durham: Duke University Press, 1997. Bradley, Peter T. British Maritime Enterprise in the New World: From the Late Fifteenth to the Mid-Eighteenth Century. Lewiston, NY: The Edwin Mellen Press, 1999. Brickell, John. Natural History of North Carolina. Dublin: James Carson, 1737. Brickhouse, Anna. The Unsettlement of America: Translation, Interpretation, and the Story of Don Luis de Velasco, 1560-1945, (New York: Oxford University Press, 2015). Bridge, David. “The German Miners at Keswick and the Question of Bismuth.” Bulletin of the Peak District Mines Historical Society, 12 (Summer 1994), 108-112. Brooks, Baylus. “John Lawson’s Indian Town on Hatteras Island, North Carolina,” North Carolina Historical Review, 91 (April 2014), 171-207. Bullard, A. J. and Charles M. Allen. “Synopsis of the Woody Species of Smilax in the Eastern United States North of Peninsular Florida,” Journal of the North Carolina Academy of Sciences, 129 (Summer 2013), 37-43. Canny, Nicholas C and Karen Ordahl Kupperman. “The Scholarship and Legacy of David Beers Quinn, 1909-2002,” William and Mary Quarterly, 60 (October 2003), 843-861. Canny, Nicholas. “Writing Early Modern History: Ireland, Britain, and the Wider World,”Historical Journal, 46 (September 2003), 723-747. Cormack, Lesley B. Charting an Empire: Geography at the English Universities, 1580-1620, Chicago: University of Chicago Press, 1997). Cowper, H. S. The Art of Attack and the Development of Weapons. Eastbourne: Naval and Military Press, 2006. Dawson, Scott and Jeanne L. Gillespie, “The Vocabulary of Croatoan Algonquian,” Southern Quarterly, 51 (Summer 2014), 48-53. Donegan, Kathleen. “What Happened in Roanoke: Ralph Lane’s Narrative Incursion,” Early American Literature, 48 (no.2, 2013), 285-314. ________. Seasons of Misery: Catastrophe and Colonial Settlement in Early America (Philadelphia: University of Pennsylvania Press, 2013). Duke, James A. Handbook of Nuts: Herbal Reference Library. Boca Raton, FL :CRC Publishers. 2000. Durant, David N. Raleigh’s Lost Colony. New York: Atheneum, 1981. Eastman, John. The Book of Swamp and Bog: Trees, Shrubs, and Wildflowers of Eastern Freshwater Wetlands. Mechanicsburg, PA: Stackpole Books, 1995. Egloff, Keith T. “Spheres of Cultural Interaction Across the Coastal Plain of Virginia in the Woodland Period,” in Structure and Process in Southeastern Archaeology, ed. Roy S. Elton, Geoffrey Rudolph. The New Cambridge Modern History: Volume 2, The Reformation, 1520-1559, 2nd ed. Cambridge: Cambridge University Press, 1990. Erichson-Brown, Medicinal and Other Uses of North American Plants: A Historical Survey with Special Reference to the Eastern Indian Tribes. Mineola, NY: Dover, 1989. Foster, Steven and Rebecca L. Johnson, National Geographic Desk Reference to Nature’s Medicine. New York: National Geographic Society, 2008. Fullam, Brandon. The Lost Colony of Roanoke: New Perspectives, Jefferson, NC: McFarland And Company, 2017. Gallivan, Martin D. “Measuring Sedentariness and Settlement Population: Accumulations Research in the Middle Atlantic Region,” American Antiquity, 67 (July 2002), 535-557. ________. James River Chiefdoms: The Rise of Social Inequality in the Chesapeake. Lincoln: University of Nebraska Press, 2003). Gardner, Paul R. “Excavations at the Amity Site: Final Report of the Pomeiooc Project, 1984-1989,” Archaeological Research Report 7, Archaeology Laboratory, East Carolina University, Greenville, NC. Gleach, Frederic W. Powhatan’s World and Colonial Virginia: A Conflict of Cultures. Lincoln: University of Nebraska Press, 2000. Green, Paul R. The Archaeology of 31HY43: “Pomieooc”: 1985-1986 Field Seasons,, Greenville, N.C: East Carolina University Department of Sociology and Anthropology, 1987. Hall, Joseph. “Glimpses of Roanoke, Visions of New Mexico, and Dreams of Empire in the Mixed-Up Memories of Geronimo de la Cruz,” William and Mary Quarterly, 72 (April 2015), 323-350. Hamel, Paul B. and Mary U. Chiltoskey, Cherokee Plants and their Uses—A 400 Year History. Sylva, NC: Herald Publishing, 1975. Hann, John T, ed. “Translation of the Ecija Voyages of 1605 and 1609 and the Gonzalez Derrotero of 1609.” Florida Archaeology. 2 (1986). 1-79. Harriot, Thomas. A Briefe and True Report of the New Found Land of Virginia. Facsimile ed. New York: Dover, 1972. Hatfield, April Lee. “Spanish Colonization Literature, Powhatan Geographies, and English Perceptions of Tsenacommacah/Virginia,” Renaissance Quarterly, 67 (Summer 2014),425-472. Heaney, Christopher. “A Peru of their Own: English Grave-Opening and Indian Sovereignty in Early America,” William and Mary Quarterly, 73 (October 2016), 608-646. Herrmann, Rachel B. “The ‘Tragicall Historie’: Cannibalism and Abundance in Colonial Jamestown,” William and Mary Quarterly, 68 (January 2011), 47-74. Hill, John. A History of the Materia Medica. London: T. Longman, 1751. Hoffman, Paul E. A New Andalucia on the Way to the Orient: The American Southeast During the Sixteenth Century. Baton Rouge: Louisiana State University Press, 1990. ________. The Spanish Crown and the Defense of the Caribbean, 1535-1585: Precedent, Patrimonialism, and Royal Parsimony. Baton Rouge: Louisiana State University Press, 1980. Horning, Audrey. Ireland in the Virginian Sea: Colonialism in the British Atlantic. Chapel Hill: University of North Carolina Press, 2013. Hudson, Charles M., ed. The Juan Pardo Expeditions: Explorations of the Carolinas and Tennessee, 1566-1568, (Tuscaloosa: University of Alabama Press, 2005). Hulton, Paul. America 1585: The Complete Drawings of John White. Chapel Hill: University of North Carolina Press, 1984. Hume, Ivor Noel. The Virginia Adventure: Roanoke to James Towne. Charlottesville: University Press of Virgnia, 1997. Isil, Olivia A. “Simon Fernandez: Master Mariner and Roanoke Assistant: A New Look at an Old Villain.” In Searching for the Roanoke Colonies: An Interdisciplinary Collection, eds. E. Thomson Shields and Charles R. Ewen, (Raleigh: North Carolina Department of Archives and History, 2003. Jones, Eric E. “Spatiotemporal Analysis of Old World Diseases in North America, A.D. 1519-1807,” American Antiquity, 79 (July 2014), 487-506. Jowitt, Clare. The Culture of Piracy, 1580-1630: English Literature and Seaborne Crime. Burlington, VT: Ashgate, 2010. Kaplan, Eugene H. Sensuous Seas: Tales of a Marine Biologist. Princeton: Princeton University Press, 2006. Keeler, Mary Frear, ed. Sir Francis Drake’s West Indian Voyage, 1585-1586, Works Issued by the Hakluyt Society, Second Series, No. 148. London: Hakluyt Society, 1975. Kelly, Brian T. and Michael K. Phillips. “Red Wolf.” In Endangered Animals: A Reference Guide to Conflicting Issues, eds., Richard P. Reading and Brian Miller. Westport, CT: Greenwood, 2000. Kelsey, Harry. Sir John Hawkins: Queen Elizabeth’s Slave Trader. New Haven: Yale University Press, 2003. Klein, Michael J. and Douglas W. Sanford. “Analytical Scale and Archaeological Perspectives on the Contact Era in the Northern Neck of Virginia.” Contact in Context: New Archaeological, Anthropological and Historical Perspectives on Natives and Europeans in the Mid-Atlantic. Eds. Julia King and Dennis Blanton. Gainesville: University of Florida Press, 2004, 47-73. Klingelhofer, Eric. “Captain Edward Stafford of the Roanoke Colonies,” North Carolina Historical Review, 77 (July 2017): 283-298. Knighton, C. S. and David Loades, eds. The Navy of Edward VI and Mary. Burlington, VT: Ashgate, 2011. Kupperman, Karen Ordahl. “Before 1607,” William and Mary Quarterly, 72 (January 2015), 3- 24. ________. Roanoke: The Abandoned Colony, 2nd ed. Lanham, MD: Rowman and Littlefield, 2007. ________. Indians and English: Facing off in Early America. Ithaca: Cornell University Press, 2000. ________. “English Perceptions of Treachery, 1583-1640: The Case of the American ‘Savages’.” Historical Journal, 20 (1977): 263-287. LaCombe, Michael A. “’A Continuall and Dayly Table for Gentlemen of Fashion’: Humanism, Food, and Authority at Jamestown, 1607-1609,” American Historical Review, 115 (June 2010), 669-687. Lance, Ron. Woody Plants of the Southeastern United States: A Winter Guide. Athens: University of Georgia Press, 2004. Lane, Kris E. Pillaging the Empire: Piracy in the Americas, 1500-1750. Armonk, NY: M. E. Sharpe, 1998. ________. The Lost Rocks: The Dare Stones and the Unsolved Mystery of Sir Walter Raleigh’s Lost Colony. Wilmington, NC: Burnt Mill Press, 2010. Lawson, John. A New Voyage to Carolina. Hugh Talmadge Lefler, ed. Chapel Hill: University of North Carolina Press, 1967. Loftfield, Thomas C. and David C. Jones. “Late Woodland Architecture on the Coast of North Carolina: Structural Meaning and Environmental Adaptation.” Southeastern Archaeology. 14 (Winter 1995), 120-135. MacCaffrey, Wallace T. Elizabeth I: War and Politics, 1588-1603. Princeton: Princeton University Press, 1992. ________. Queen Elizabeth and the Making of Policy, 1572-1588. Princeton: Princeton University Press, 1981. MacGregor, A. “Medical terra sigillata: A Historical, Geographical and Typological Review,” in A History of Geology and Medicine, C. J. Duffin, R. T. J. Moddy and C. Gardner-Thorpe, eds., Geological Society, Special Publication 375. London: The Geological Society, 2013, pp. 113-136. MacMillan, Ken. “Sovereignty ‘More Plainly Described’: Early English Maps of North America, 1580-1625,” Journal of British Studies, 42 (October 2003), 413-447. ________. “Gift Exchange and the Ossomocomuck Balance of Power: Explaining Algonquian Socioeconomic Aberrations at Contact,” in Searching for the Roanoke Colonies: An Interdisciplinary Collection, eds. E. Thomson Shields and Charles R. Ewen, (Raleigh: North Carolina Department of Archives and History, 2003. ________. “In the Hands of ‘Indian Givers’: Exchange and Violance at Ajacan, Roanoke and Jamestown.” Ph.D. diss., University of Virginia, 1998. Mancall, Peter C. Hakluyt’s Promise: An Elizabethan’s Obsession for an English America, New Haven: Yale University Press, 2007. Markham, Clement., ed., The Guanches of Tenerife. London: The Hakluyt Society, 1867. Mulcahey, Matthew. Hurricanes and Society in the British Greater Caribbean, 1624-1783. Baltimore: Johns Hopkins University Press, 2008. Miller, Christopher L. and George Hamell, “A New Perpsective on Indian-White Contact: Cultural Symbols and Colonial Trade, Journal of American History, 73 (1986), 311-328. Miller, Lee. Roanoke: Solving the Mystery of the Lost Colony, (New York: Arcade, 2000). Miller, Shannon. Invested with Meaning: The Raleigh Circle in the New World, Philadelphia: University of Pennsylvania Press, 1998. Mires, Peter B. “Contact and Contagion: The Roanoke Colony and Influenza.” Historical Archaeology. 29 (1994): 30-38. Monardes, Nicholas. Joyfull Newes Out of the New Founde World, ed. Sir. Stephen Gaselee, (New York: Alfred A. Knopf, 1925). Mt. Pleasant, Jane. “The Science Behind the Three Sisters Mound System: An Agronomic Assessment of an Indigenous Agricultural System in the Northeast.” In John E. Staller, Robert H. Tykot and Bruce F. Benz, eds., Histories of Maize: Multidisciplinary Approaches to the Prehistory, Linguistics, Biogeography, Domestication and Evolution of Maize. Amsterdam: Academic Press, 2006. Oberg, Michael Leroy. 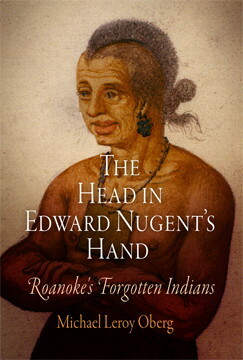 The Head in Edward Nugent’s Hand: Roanoke’s Forgotten Indians, Philadelphia: University of Pennsylvania Press, 2007). ________. “Between ‘Savage Man’ and ‘Most Faithful Englishman’: Manteo and the Early Anglo-Indian Exchange,” Itinerario, 24 (2000), 146-169. ________. “Gods and Men: The Meeting of Indian and White Worlds on the Carolina Outer Banks, 1584-1586,” North Carolina Historical Review, 76 (1999), 367-390. ________. Dominion and Civility: English Imperialism and Native America, 1585-1685. Ithaca: Cornell University Press, 1999. Palmer, William M. and Alvin W. Braswell. Reptiles of North Carolina. Chapel Hill: University of North Carolina Press, 1995. Parramore, Thomas C. “The ‘Lost Colony’ Found: A Documentary Perspective.” North Carolina Historical Review, 78 (January 2001): 67-83. Phelps, David Sutton. Ancient Pots and Dugout Canoes: Indian Life as Revealed by Archaeology at Lake Phelps. Creswell, NC: Pettigrew State Park, 1989. Pearson, Thomas Gilbert, C. S. Brimley, and H. H. Brimley, Birds of North Carolina. Raleigh: Edwards and Broughton, 1919. Pluymers, Keith. “Atlantic Iron: Wood Scarcity and the Political Ecology of Early English Expansion,” William and Mary Quarterly, 73 (July 2016), 389-426. ________. “Taming the Wilderness in Sixteenth- and Seventeenth-Century Ireland and Virginia,” Environmental History, 16 (October 2011), 610-632. Potter, Stephen R., Commoners, Tribute and Chiefs: The Development of Algonquian Culture in the Potomac Valley, Charlottesville: University Press of Virginia, 1993. Powell, William S. “Who Came to Roanoke?” Searching for the Roanoke Colonies: An Interdisciplinary Collection, eds E. Thomson Shields and Charles R. Ewen. Raleigh: North Carolina Department of Archives and History, 2003. ________. “Who were the Roanoke Colonists?” Raleigh and Quinn: The Explorer and His Boswell. H. G. Jones, ed. Chapel Hill: The North Carolinia Society, 1987. Pp. 51-67. ________. “Roanoke Colonists and Explorers: An Attempt at Identification.” North Carolina Historical Review. 34 (April 1957): 202-226. Probasco, Nate. “Cartography as a Tool of Colonization: Sir Humphrey Gilbert’s 1583 Voyage to North America,” Renaissance Quarterly, 67 (Summer 2014), 425-472. Quinn, David Beers. Quinn, David Beers. Explorers and Colonies: America, 1500-1625. London: Hambledon Press, 1990. ________. Set Fair for Roanoke: Voyages and Colonies, 1584-1606, Chapel Hill, NC: University of North Carolina Press, 1985. ________. “Drake, Sir Bernard,” in Dictionary of Canadian Biography, vol. 1, University of Toronto/Université Laval, 2003–, accessed May 23, 2014, http://www.biographi.ca/en/bio/drake_bernard_1E.html. ________, ed., The Roanoke Voyages, 2 vols. London: Hakluyt Society, 1955. ________, ed., The Voyages and Colonizing Enterprises of Sir Humphrey Gilbert, London: Hakluyt Society, 1940. Raffaele, Herbert A. and James W. Wiley. Wildlife of the Caribbean. Princeton: Princeton University Press, 2014. Ralegh, Sir Walter. The Discoverie of the Large, Rich and Bewtiful Empyre of Guiana. Neil L. Whitehead, ed. Norman: University of Oklahoma Press, 1997. Rountree, Helen C. The Powhatan Indians of Virginia: Their Traditional Culture, Norman: University of Oklahoma Press, 1992. Rowse, A. L. Sir Richard Grenville of the Revenge. London: Cape, 1937. Schmidt, Ethan A. “The Well-Ordered Commonwealth: Humanism, Utopian Perfectionism, and the English Colonization of the Americas,” Atlantic Studies, 7 (Spring 2010), 309-328. Schroeder, Sissel. “Maize Productivity in the Eastern Woodlands and Great Plains of North America.” American Antiquity, 64 (July 1999), 499-516. Schwartz, Frank Joseph. Sharks, Skates and Rays of the Carolinas. Chapel Hill: University of North Carolina Press, 2003. Seed, Patricia. Ceremonies of Possession in Europe’s Conquest of the New World, 1492-1616. Cambridge: Cambridge University Press, 1995. Shaw, William A. The Knights of England. London: Sherratt and Hughes, 1906. Shirley, John. Thomas Harriot: A Biography. London: Oxford University Press, 1983. Shirley, John, ed., Thomas Harriot: Renaissance Scientist, London: Oxford University Press, 1974. Slattery, Britt, Katheryn Reshetiloff and Susan Zwicker, Native Plants for Wildlife Habitat and Conservation Landscaping: Chesapeake Bay Watershed, (Annapolis, MD: U.S. Fish & Wildlife Service, 2003). Silberhorn, Gene M. Common Plants of the Mid-Atlantic Coast: A Field Guide. Revised ed., Baltimore: Johns Hopkins University Press, 1999. Sloan, Kim. A New World: England’s First View of America, Chapel Hill: University of North Carolina Press, 2007. Speck, Frank G. “Catawba Medicines and Curative Practices.” Publications of the Anthropological Society, 1 (1937), 179-197. Stahle, David W., Malcom K. Cleaveland, Dennis B. Blanton, Matthew D. Therrell, and David, “The Lost Colony and Jamestown Droughts.” Science, New Series, Vol. 280, No., 5363 (24 April 1998), 564-567. Stephenson, James. Herring Fishermen: Images of an Eastern North Carolina Tradition. Charleston: History Press, 2007. Stick, David. 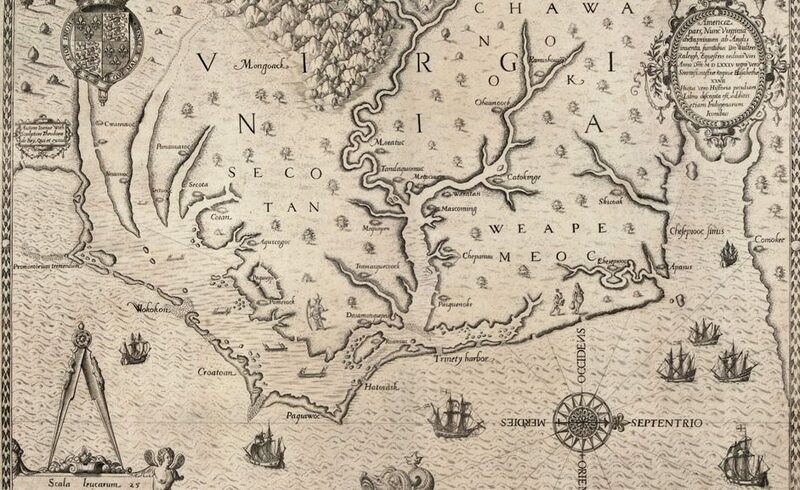 Roanoke Island: The Beginnings of English America. Chapel Hill: University of North Carolina Press, 1983. Strachey, William. Historie of Travaile into Virginia Britannia, London: Hakluyt Society, 1849. Sugden, John. Sir Francis Drake. New York: Random House, 1990. Taylor, E. G. R., ed., The Original Writings and Correspondence of the Two Richard Hakluyts, 2 vols. London: Hakluyt Society, 1935). Townshend, Camilla. Pocahontas and the Powhatan Dilemma, New York: Hill and Wang, 2005. VanDerwarker, Amber M. “An Archaeological Study of Late Woodland Fauna in the Roanoke River Basin,” North Carolina Historical Review, 50 (January 2001), 1-46. Vaughan, Alden T. Transatlantic Encounters: American Indians in Britain, 1500-1776, Cambridge: Cambridge University Press, 2006. ________. “Powhatans Abroad: Virginia Indians in England.” In Envisioning and English Empire: Jamestown and the Making of the North Atlantic World. Eds. Robert Appelbaum and John Wood Sweet. Philadelphia: University of Pennsylvania Press, 2005. ________. “Sir Walter Ralegh’s Indian Interpreters, 1584-1618,” William and Mary Quarterly, 59 (April 2002), 341-377. Webb, Stephen Saunders. The Governors-General: The English Army and the Definition of Empire, 1569-1681, (Chapel Hill: University of North Carolina Press, 1979). Wernham, R. B. The Making of Elizabethan Foreign Policy. Berkeley: University of California Press, 1980. Whitaker, John O., Jr. and William J. Hamilton, Jr. Mammals of the Eastern United States. Reprint ed. Ithaca: Cornell University Press, 1998. White, Sam. “’Shewing the Difference Betweene Their Conjuration, and our Invocation on the Name of god for Rayne’: Weather, Prayer, and Magic in Early American Encounters,” William and Mary Quarterly, 72 (January 2015), 33-56. Whyte, Thomas R. “Reanalysis of Ichthyofaunal Specimens from Prehistoric Archaeological Sites on the Roanoke River in North Carolina and Virginia,” North Carolina Archaeology, 57 (October 2008), 97-107. Wright, Irene A., ed. Further English Voyages to Spanish America, 1583-1594. London: the Hakluyt Society, 1951.